Asebella custom fragrant oils are blended natural ingredients to make your home, office or any special place smell great. 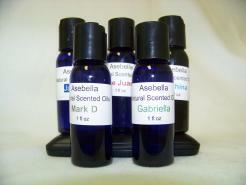 These scents are so unique, we have named them a lot of them after family, friends and employees of Asebella. So, choose your favorite scent or a name that means something to you. They all smell great. Remember, these oils are safe to use in any fragrant oil burner (that works with a bulb, not an open flame). Because these oils are all natural.